Devesh Uba - Indian Photojournalist with a Passion - Haba Naija! Words by by Devesh Uba: Even before coming to Nigeria, I knew about Wole Soyinka. 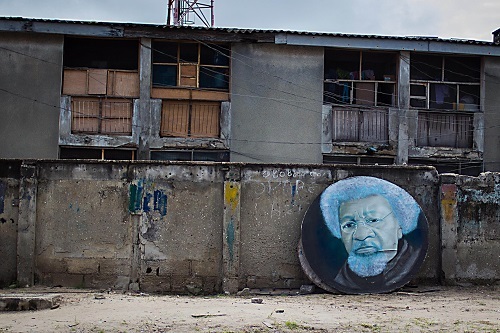 Wole is indeed this country’s brand ambassador and I was quite surprised to see his (abandoned) portrait on streets in Victoria Island, Lagos. I captured this picture because to me it speaks a lot about Nigerian talent and I titled it ‘genius on the streets’. Words by Devesh Uba : I have always been fascinated with art, and I have seen a lot of paintings by the street side in Lagos. I took this picture firstly because of the gorgeous evening light. The bigger reason here however, was the art itself. 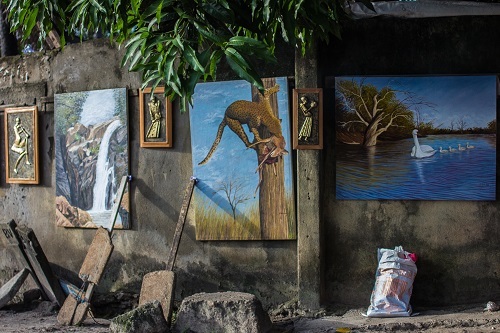 The paintings here highlight the beauty of nature and it was quite a contrast to the hustling Lagos mega-city. Nature is an artist’s biggest inspiration and I think this picture brings it out pretty well. In what is now a rare profession in Nigeria, it’s hard to find someone who dedicates his time to telling stories mainly with pictures, that was why when I caught up with Devesh Uba, an Indian Photojournalist, currently in Nigeria, I had to ask him a lot of things about his profession. With Photojournalist not many in Nigeria, I asked him why he was in this country, he said the world is excited about Nigeria at the moment. Every one wants to know more about this country, primarily because of economic reasons, and as a social marketer, when the chance presented itself for him to be in Lagos, he couldn’t resist. While praising the Nigerian people and their spirit, he admired the respectful way they welcome and greet you, he was also quick to notice their love for football. I now then went on to ask why he chose photojournalism? He made me know that as a self-trained photographer, he loved to tell stories with pictures and the use of the Internet to share them with the world. Knowing he was an Indian, i was also shocked when i saw the name of his blog called, “Snap It Oga” and wanted to know how he derived the name, he said, he decided to start a blog for his Nigerian photos to showcase the vibrant colors and hustle of the place. In just a couple of months, he’s blog had close to two hundred followers which he believed was a positive (and humble) start. The first few people he photographed in Lagos would say “Snap it, Oga” so when he was looking at them through he’s camera viewfinder, the name stayed on, and he named the blog ‘Snap It Oga’! Devesh he has already made plans to visit other parts of Nigeria including Enugu and troubled Kano State. And a word for those how look to follow he’s line of work, he said, it’s not difficult, as if you can tell a story, know how to use the Internet and a camera, you can become an independent photojournalist. As sharing your works online won’t be a problem, thanks to the different social networking platforms available. Equipment used to take the pictures in this article: Canon 550D DSLR camera with Canon 35mm F2 lens. PreviousHabanaija Facebook Like, Comment, Share and Invite Contest Winners!! !